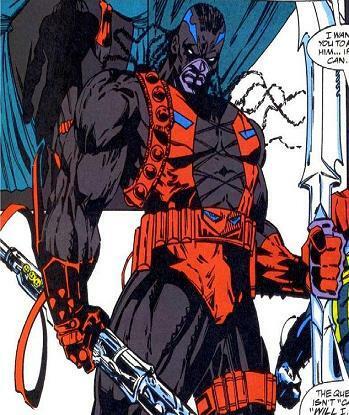 Powers/Abilities: Killjoy possessed no superhuman powers and relied on a wide variety of weapons that he was shown to have great skill at using. He was also very big and muscular and had an uncanny ability to move about quietly without being noticed. He also demonstrated the use of military tactics and the assassination skills. He carried a large arsenal of weapons that were housed mostly on his back. He had two Adamantium blades that snapped together to make a large double-bladed sword which he could use to deadly effect, plus an assortment of other small-bladed knives in his boots. He had a wrist mounted weapon that fired a blast of metal shrapnel, an assortment of guns that shot an unidentified form of energy and a flame thrower with a limited range and fuel capacity. (Deathlok II#23 - BTS) - Killjoy joined Moses Magnum’s superhuman army and may have been present when the African nation of Canaan was usurped. (Deathlok II#23) - After the Black Panther and Deathlok left Canaan and learnt that Moses Magnum was the new ruler, Killjoy was sent to Wakanda to assassinate T’Challa (Black Panther) and throw his nation into confusion, thus setting the stage for an invasion force. He quietly snuck into the Wakandan palace in the middle of the night and quickly killed a guard. Thinking that he was about to be discovered by a woman wandering down the hallway, he was about to slay her (Deathlok’s wife) but changed his mind because he noticed that she was pregnant. He entered T’Challa’s bedroom and just as he was about to strike, the Wakandan king awoke and knocked him aside with a kick. Killjoy began firing metal shrapnel from a wrist-mounted weapon. The projectiles struck the Black Panther in the back as he jumped in front of his fiancée, Monica Lynne, in order to protect her. Killjoy then drew a gun and tried to shoot him but was interrupted by Deathlok's arrival, who knocked his weapon from his hand. Killjoy revealed to Deathlok that he was a ruthless force for justice and felt that the Black Panther was evil. 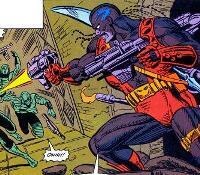 He then drew an Adamantium sword and in a quick stroke, sliced off Deathlok’s cybernetic right arm. (Deathlok II#24) - Killjoy again pulled out a gun to shoot the Black Panther but missed as Deathlok, slightly recovering from his wound, knocked him aside. He began to blast the cyborg and decided to flee after noticing his weapon's energy blasts had no effect. Now desperately trying to flee the palace, he shot several guards while being pursued. He again drew his sword but this was knocked aside by Deathlok and he dropped it to the floor. Killjoy armed himself with a small portable flamethrower mounted on his back and proceeded to blast away at Deathlok, but the cyborg hero proved to be immune to this as well. Running out of fuel and options, Killjoy quickly exited the palace but was tackled by the cyborg as he attempted to flee across a nearby creek bed. He surrendered and was then arrested and taken away by the Wakandan military forces. (Deathlok II#25) - Killjoy yelled at Deathlok and called him a hypocrite as the cyborg ran past his jail cell armed with an arsenal of weapons to defend Wakanda from Moses Magnum’s invasion force. It is unknown if he was set free after the conflict was over when Moses Magnum was captured, as many of Canaan’s captured soldiers were released to return back to their own country. Comments: Created by Dwayne McDuffie (writer), Walter McDaniel (pencils) and Brad Vancata (inks). Killjoys’s actions were dictated by a code of honor and he only killed if this did not interfere with his beliefs. He also had a cocky attitude and had the tendency to say, “Ain’t nobody bad like Killjoy”, which implied he was very overconfident in his abilities and believed himself better than anyone when it came to killing. He also thought himself as a hero and that the Black Panther was truly evil and had to be eliminated. He may have been misled by Moses Magnum who was trying to establish a new homeland for anyone of African descent.